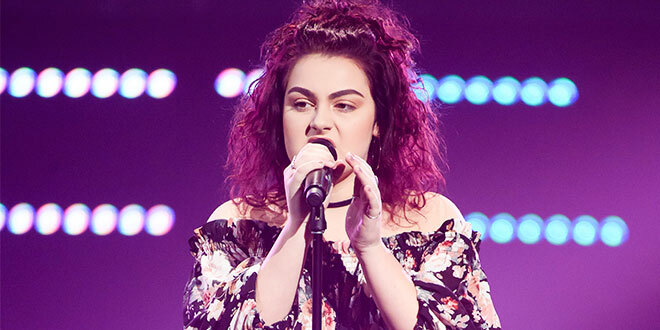 Rising star: Ruby Jo performs on The Voice. Photo: ITV Studios. SOULFUL singer and Emmaus College student Ruby Jo has described her time on television series The Voice as a “blessed” experience. The 15-year-old Chambers Flat musician performed Scars to Your Beautiful by Alessia Cara, gaining a place on United Kingdom singer Seal’s team. She appeared in the subsequent knockout round on May 23 which marked the end of her journey on the program. Despite not being named the show’s best voice, Ruby Jo told The Catholic Leader her time on The Voice was the step she needed to believe in herself. “Never in a million years did I think I would be doing anything like it,” she said. Last year the Year 11 student watched her music teacher Kim Sheehy take a spot on Delta Goodrem’s team on The Voice. Ruby Jo said it was because of her music teacher that she mustered up the courage to make a blind audition. Miss Sheehy is now pursuing a music career in Sydney but was in the audience for both of Ruby’s performances on The Voice. A self-described soulful and indie singer, Ruby Jo had memorised all of Delta Goodrem’s songs by the time she was three years old. “For me, it’s just been something that I love doing,” she said. While she never got a chance to tell Delta Goodrem about her childhood ambitions, Ruby was fortunate to have two pop stars, Seal and Boy George, fight to have her on their team. She said she chose Seal because “Seal and I just connected”. The pair had several mentoring sessions before the knockout performance aired on Channel 9. Ruby said The Voice was just the beginning of her music career, and she plans to release her first self-produced EP at the end of the year.